The Law Office of W. Scott Kimberly will hold its Second Annual Free Divorce Giveaway on Valentine’s Day, open for entry immediately and closing on February 15, 2019 at 5:00 p.m. Central Standard Time. The Murfreesboro Voice published an article this week outlining the local bar association’s efforts to give back to the public through low-cost and no-cost legal services programs. 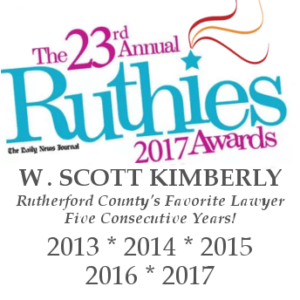 The article, written by Michelle Willard, provided information about the Tennessee Supreme Court’s Access to Justice Commission and included information about the Rutherford and Cannon County Bar Association as well. Scott currently serves as the RCCBA President and is quoted in the article in full support of the Access to Justice goals and initiatives. To learn more about the RCCBA Pro Bono programs, you can check out the RCCBA Website at rccba.com. How Long Will My Conviction Remain on My Criminal Record and Background Check? I am often asked “how long will a conviction remain on my criminal record?” The answer depends on the type of conviction. Depending on the type of conviction, it will remain on your record for one of three lengths of time: (1) until the end of your probation period; (2) for five years following the end of your probation period; or (3) for the rest of your life. A criminal conviction is removed through expungement, which means to erase that criminal conviction from your record. Under a diversion program, a defendant pleads guilty and enters into a probation period. If the defendant completes all the conditions of probation, and the probation period ends, the defendant can return to court and have the charge expunged from his record at that time. Through a diversion program, a criminal conviction will remain on your criminal record until you return to court after the probation period and have it expunged. Under T.C.A. 40-32-101(G), a person may have a conviction expunged from their criminal record if: (1) the conviction qualifies for removal; (2) the person has had no criminal convictions since that conviction; and (3) the person has waited at least five years from the end of the sentence to ask for expungement. If you meet all three requirements, you can petition the court to have your conviction expunged. Through this process, a criminal conviction will remain on your record for at least five years from the end of your sentence. Unfortunately, there are some crimes that simply cannot be expunged from your criminal record. In such a situation, a conviction will remain on your criminal record, and be discovered in background checks, for the rest of your life. To learn more about expungement, and to learn how you can access the courts to have your convictions removed, contact an experienced criminal defense attorney. What is the Difference Between a Dismissal and a Retirement? I am often asked what is the difference between a retirement and a dismissal? In short, the short term looks a lot different between these two things, but the long term looks the same. A dismissal is exactly what it sounds like; the State dismisses the charge against you. In Murfreesboro criminal cases, for General Sessions and Circuit Court, the District Attorney may decide to dismiss charges for a number of reasons. A dismissal means that the State has decided not to pursue charges against you and will end the case at that time. A retirement is best described as a delay with a dismissal at the end. A retirement means that the case will be continued, which means we will pick a new court date in the future, for a certain period of time. After that period, if you have complied with certain requirements, then the case will be dismissed (see dismissal definition above). The difference between a dismissal and a retirement is what happens in the short term during the first six months to a year after your court date. Under a dismissal, there is no immediate actions that you need to take. Under a retirement, you may be required to perform certain tasks or conditions. If a case is dismissed, it is over, which means that you have no restrictions on your behavior and no conditions you have to complete. In the short term, you are free to act however you wish, just as you were prior to being arrested and/or charged. In the long term, your case is dismissed and expunged from your record. If a case is retired, then the case is not over. Instead, you have a new court date, likely one year away, and you have a signed agreement that you will complete certain conditions during that year. If, and only if, you complete those conditions, then the case will be dismissed. In the long term, like a dismissal, your case is dismissed and expunged from your record. As always, if you have questions about Murfreesboro criminal cases, consult a Murfreesboro criminal defense lawyer about your case.